When a tuning fork of frequency f is excited and held near one end of a straight pipe of length L open at both ends, the air column in the pipe vibrates in its fundamental mode and is in resonance with the tuning fork. The pipe is now kept vertical in a jar containing water so that half the length of the pipe is inside water. What should be the frequency of the tuning fork to be used to make the air column vibrate in its fundamental mode in resonance with the tuning fork now? 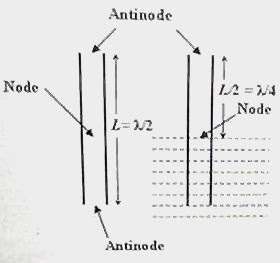 The air column in the closed pipe (pipe closed at one end) on the other hand vibrates in its fundamental mode, with a node at the closed end (at the water surface inside the pipe) and the neighbouring antinode at the open end so that L/2 = λ/4. Again we obtain λ = 2L. The frequencies in the two cases are same so that the correct option is (a). (2) A string of length L metre has mass M kg. It is kept strtched under a tension T newton. If a transverse jerk is given at one end of this string how long does it take for the disturbance to reach the other end? 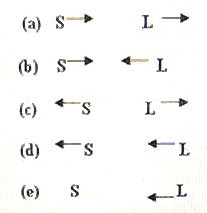 t = L/v where v is the velocity of the disturbance. v = √(T/m) where T is the tension in the string and ‘m’ is the linear density (mass per unit length) of the string. Since m = A ρ where A is the cross section are and ρ is the density of the material of the wire, the linear density is directly proportional to the cross section area. When the cross section area is reduced to half the initial value, the linear density is reduced to half the initial value. The frequency of the unknown fork must be either 342 Hz or 350 Hz since 4 beats are produced initially. When the fork of frequency 346 Hz is loaded with wax, its frequency is reduced. The number of beats then increased since its frequency is lower than that of the unknown fork. The frequency of the unknown fork must therefore be 350 Hz. (a) In the case shown in figure (a) the apparent frequency as heard by the listener is equal to the real frequency of the source. (b) In the case shown in fig (b) the apparent frequency as heard by the listener is the greatest. (c) In the case shown in fig (c) the apparent frequency as heard by the listener is the least. (d) In the case shown in fig (d) the apparent frequency as heard by the listener is less than the real frequency of the source. (e) In the case shown in fig (e) the apparent frequency as heard by the listener is greater than the real frequency of the source. When the source moves towards the listener and/or the listener moves towards the source the apparent frequency is increased. When the source moves away from the listener and/or the listener moves away from the source the apparent frequency is decreased. If there is no relative motion between the source and the listener there is no change in the frequency. So statement (d) is incorrect. (Since there is no relative motion between the source and the listener there is no change in the frequency. Note that they are moving with the same velocity). Option (d) is the answer. y2 = 0.007 sin (610 π t) respectively. y = a sin ωt where y is the displacement at the instant t, a is the amplitude, and ω is the angular frequency. The angular frequency ω is related to the linear frequency f as ω = 2πf. The number of beats heard is 305 – 302 = 3 [Option (c)].